If you read my previous post about our New Year’s traditions, you know about the importance that Italians place upon some food symbols of plenty. This occasionally verges on the superstitious, and on New Year’s Eve you will see some people stuffing themselves with lentils and grapes as if there’s no tomorrow. The Spanish also follow this custom of eating grapes at midnight, but they stop at 12, one for each month of the new year. Both in the Judeo-Christian and in the pagan/Greek-Roman traditions, grape clusters deliver such a symbolic punch that it’s quite clear why they have become the center of our celebrations for Capodanno (New Year’s Eve); either in their natural form, which can be appreciated by everybody beyond age, cultural and religious barriers, or in the form of wine – the bubbly, sparkly spumante for the midnight toast! As proven by countless sculptures, frescos and paintings, grapes in Italy have been for hundreds of years the allegory of wealth and well-being. Finally, all of these ingredients together – grapes, spumante and rice – find their place from time immemorial on my family’s New Year’s table. About half an hour before midnight, I start cooking my signature risotto, which I keep “all’onda” (like the waves, creamy and liquidy – that’s how we like it in Venice) and toss with really good butter and parmigiano. With a pomegranate salad and sides of lentils and salmon, followed by a slice of panettone and a fragrant flute of spumante or prosecco, it’s the perfect start to a delicious new year! In a saucepan, bring the stock to a boil, reduce the heat and keep at a low simmer. In a large heavy or non-stick saucepan, melt 1 tbsp butter, add the shallot and cook for 3 minutes until tender. Add the rice and stir , coating it in the butter. Continue “toasting” the rice, stirring, for 3 minutes Add the Prosecco, Brut or Champagne, and simmer until it has evaporated. Add 1/2 cup of hot broth and stir until almost completely absorbed (2 minutes). Continue cooking the rice, adding the broth a ladleful at a time, stirring almost constantly and allowing the broth to absorb before adding the next ladleful, until the rice is “al dente” (tender but firm to the bite) and the mixture is very creamy. About half-way through the cooking add the halved grapes. It usually takes about 20 minutes total. Turn off the heat, adjust the salt and pepper, stir in the remaining butter, and parmigiano cheese to taste. Serve immediately. It was eight years ago, just a few months after moving to the City, that I experienced my first Manhattan Thanksgiving: ironically, I ended up celebrating the quintessential American holiday at an Italian friend’s home. Daniela had arrived in New York one year before me, and was so smitten with it that she scored higher on the Time Out Magazine test “Are You a Real NewYorker?” than all our American friends. It was her idea to throw an Italian-style Thanksgiving dinner, incorporating the various traditional foods of the holiday into Italian recipes. Given that she is a superb cook, carrying the extraordinary legacy of three different Jewish Italian culinary styles – the Piedmontese, the Venetian and the Ferrarese – it’s no surprise that the meal was an absolute masterpiece. I had the impression that for the American guests, eating these Italian delicacies instead of the classic turkey with cranberry sauce also felt a little naughty! While I can’t replicate the special atmosphere of that night, after Daniela moved to Israel I adopted her tradition of remembering the Pilgrims with the regional dishes from my own country. I’m used to cooking around symbolic foods for Passover and Rosh haShana: turkey and pumpkin, the most recognizable Thanksgiving ingredients, also appear on my Rosh HaShana table, and again on Sukkot. The connection with Sukkot runs even deeper, as both holidays are harvest festivals: some historians have gone so far as to trace the roots of Thanksgiving in Sukkot, based on encounters the Pilgrims supposedly had with Sephardic Jews in Holland before they left for the Americas. But whether or not this story is true, Jews celebrate Thanksgiving Day with an intensity usually reserved to our most sacred holidays: it’s easy for us to empathize with the pilgrims, who had to flee religious discrimination and persecution and travel across an ocean to find freedom – and with their sweat and faith, fought against illness and scarcity, finally turning America’s wilderness into their “Promised Land”. While the turkey and pumpkin are symbols of bounty, one food on the table is meant to remind us of the harsh winter before the first harvest, when the pilgrims barely had enough to eat. It’s the corn, as it is said that at one point there was so little food that each person was given only five kernels of corn per day. Corn bears a similar type of double-symbolism in Italian history: when it found its way to Italy from the Americas, it immediately spread through the North, and landowners started reaping huge profits by feeding their workers only maize polenta – creamy, delicious and filling, but so poor of vitamins and protein that it caused an epidemic of Pellagra, the same deficiency disease that spread in the American South during the great Depression, leading to deterioration and death. Somehow, native Americans had avoided it because they added wood ashes and lime to cornmeal, correcting its nutritional imbalance. Cranberries can also be read as a symbol of suffering: of course we combine them with a lot of sugar to make them palatable, but their nature is extremely sour. This reminds me of the symbolism of sweet and sour dishes in Jewish Italian Cuisine, in which the sugar or honey represent the need to appreciate our present and future, while the vinegar or lemon keeps us rooted in our people’s past suffering. While giving thanks for the plentiful new crop, and the many blessings that we enjoy each year, we also remember those who didn’t make it through that terrible first winter. Have a meaningful Thanksgiving! Preheat the oven to 400 F. Prepare the polenta with one scant cup of maize according to instructions on the package, using only about 1 1/4 cup boiling water (traditional polenta tastes better than instant, and you can make it quickly using a pressure cooker… however, instant is OK! Beretta makes a nice product). The polenta has to be on the thick side. When cooked, pour it over a large cutting board or platter in a wide and low heap and allow it to cool (feel free to pop it into the fridge). Plump the cranberries or raisins in the grappa or brandy. Dice the candied fruit very small. Discard the film that has formed over the polenta. Cut the polenta into pieces and place it into a food processor. 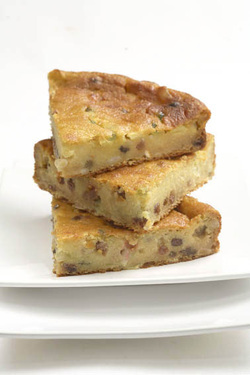 Process it with the eggs, salt, sugar, oil, sifted flour with baking powder; add the raisins in their liqueur, the candied fruit, pine nuts, and the lemon zest and mix well. If the batter is so thick that it’s hard to pour into the pan, you can add just a couple of spoonsfuls of water or non-dairy milk. Grease a 9″ springform pan and dust it with corn meal. If you have parchment, you should line the bottom of the pan before greasing it: this type of batter is very sticky. Pour the mix into it and bake in a pre-heated 400 F oven for about 15 minutes until it forms a golden crust, then lower the heat to 350 and bake for another 30-45 minutes (the cake should bake for 45-60 minutes total). Allow to cool before turning out. 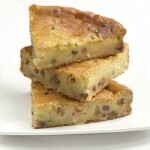 Serve warm, sprinkled with confectioner’s sugar. How could we possibly welcome fall, and celebrate Thanksgiving, without pumpkin? For me, this also one of the symbols in my family’s Rosh haShana seder and under the sukkah. 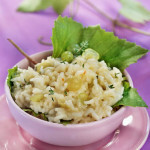 One of my favorite ways to serve it is in a creamy and delicious risotto! Those who were born in the Veneto region, like me, also celebrate red radicchio and like to incorporate it into many different recipes. While a similar type of lettuce was already grown in North-Eastern Italy before the 16th century, the exact kind we eat today, with its white-veined leaves, was engineered in the late 1800s by a Belgian agronomist. The different varieties are named after the Nothern Italian regions where they are cultivated: the easiest to find here in the United States is radicchio di Chioggia (maroon and round), and sometimes the radicchio di Treviso, which looks like a large red Belgian endive. Its mildly bitter flavor blends beautifully with the sweetness of the pumpkin or squash! Heat 2 tablespoons oil in a skillet. Add the pumpkin and half of the onions and cook on medium heat, stirring frequently, for about 10 minutes. Season with salt, nutmeg, pepper and cook, stirring occasionally, until most of the liquid has evaporated and the pumpkin is tender, another 12 to 15 minutes. Remove from the heat and let cool slightly, then transfer to a food processor and puree the pumpkin. Rinse the skillet and heat another tablespoon of oil in it. Add the radicchio (sliced into thin stripes) and cook for 5 minutes, seasoning with salt. Set aside. In a medium saucepan, bring the stock to a boil, reduce the heat and keep it hot. In a heavy pot, heat the remaining 2 tablespoons oil. Add the remaining onion and cook for 2 minutes. Add the rice and cook over moderately high heat, stirring, for a few minutes. As soon as it starts sticking to the bottom, pour in the wine and allow it to evaporate. Immediately lower the heat and pour in one ladleful of the hot stock and cook, stirring constantly, until all of the liquid has been absorbed. Gradually add more hot stock, 1 ladleful at a time, stirring frequently until absorbed before adding the next. After about 15 minutes, stir in the pumpkin puree and continue cooking, adding more stock, 1 ladleful at a time, until the rice is tender but “al dente” (about 5 to 15 minutes longer, depending on the type of rice). The risotto should be creamy and loose. Add the radicchio, and more salt if necessary. The risotto will be quite loose. 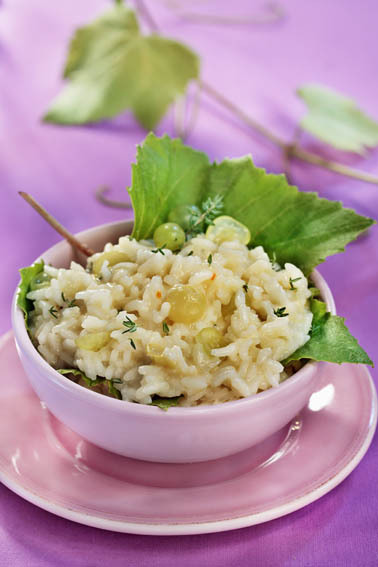 Spoon the risotto into warmed soup plates and drizzle with little balsamic vinegar. Serve immediately. 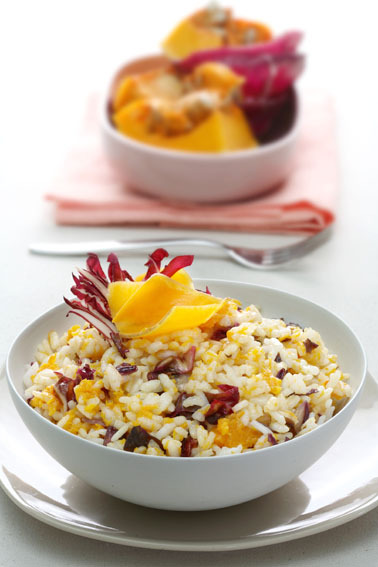 Of course if you want to be really fancy and impress your guests, you could also serve the risotto in the pumpkin shell. 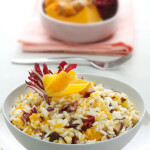 *** For a slightly different result, you can also cook the pumpkin with the rice. Just add the pumpkin to all the onion at the beginning, and then add the rice. Try both versions, and see which one is your favorite! In the context of a dairy meal, this risotto tastes delicious with the addition of butter and parmigiano. On the other hand, the creaminess and sweetness of the pumpkin make it very enjoyable as a Parve (non-dairy) dish!